River Valley junior Rory Twyman (3) dribbles to the wing, during the Raiders’ season opening loss to Eastern on Dec. 1 in Bidwell, Ohio. BIDWELL, Ohio — Regardless of the records, these teams were about as even as they could be. The unbeaten Southern and winless River Valley boys basketball teams were tied after the first half, at the end of regulation and at the conclusion of the first overtime in a non-conference battle on Saturday, but the visiting Tornadoes earned a two-point edge in the second extra session and escaped Gallia County with a 73-71 victory. The Tornadoes (3-0) — who’ve surpassed the 70-point plateau in each of their games this winter — claimed a 20-15 lead eight minutes into play, allowing the Raiders (0-4) to sink just three field goals in the stanza. River Valley — which posted a season-high in points on Saturday — made up the five-point margin in the second quarter, outscoring the Purple and Gold by a 16-11 clip, while holding SHS to just a trio of field goals to tie the game at 31. On the strength of two trifectas in the third quarter, Silver and Black outscored their guest by a 14-11 tally, and the hosts headed into the fourth ahead 45-42. In the fourth quarter, both teams sank six field goals, including a pair of three-pointers apiece. However, Southern sank 5-of-9 free throws in the period, while RVHS made just 2-of-6, leaving the teams tied at 61. Both squads scored three points in the first overtime session, River Valley on a Rory Twyman three-pointer and Southern on a Coltin Parker two-pointer and a Brayden Cunningham free throw. 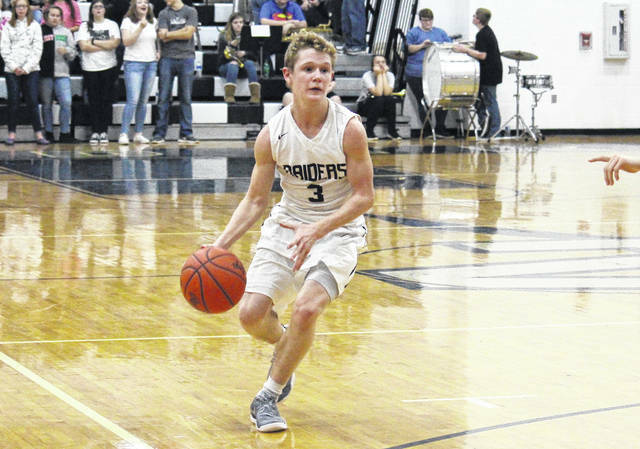 In the second overtime, Twyman hit another trifecta for the hosts, while Dustin Barber and Matthew Mollohan both contributed a two-pointer to the RVHS cause. Meanwhile, the Tornadoes made just one field goal — a Weston Thorla two-pointer — but had five players combine to make 7-of-9 free throws, sealing the 73-71 victory. With five players in double-figures scoring for the second straight game, Southern was led by Parker with 14 points, nine of which came from beyond the arc. Cunningham, Thorla and Dylan Smith scored 13 points apiece for the victors, while Trey McNickle poured in 10. Jensen Anderson had seven points in the victory, while Austin Baker came up with three. In addition to Parker’s trio of three-pointers, Thorla and Anderson both sank a triple in for the guests. For the Raiders, Barber led the way for scoring 22 points, 10 of which came from the charity stripe. Jarret McCarley was next for RVHS with 14 points, followed by Twyman with 11 and Layne Fitch with seven. Patrick Brown and Chase Caldwell both had six markers, Mollohan and Kyle Coen added two points apiece, while Jordan Lambert rounded out the team total with one point. Twyman connected on a trio of three-pointers for the Silver and Black, Caldwell hit a pair of trifectas, while McCarley and Fitch made one each. For the game, Southern shot 24-of-35 (68.5 percent) from the free throw line, where River Valley was 18-of-28 (64.3 percent). This was the lone scheduled meeting between RVHS and SHS this season. Both teams get back to action in their respective leagues on Tuesday, with the Raiders hosting Vinton County, and the Tornadoes traveling to Trimble.